As the weather turns and the season changes, sweaters and coats emerge from the darker recesses of the wardrobe and, if you're like me, you may realise it's time for some upgrades. Finding tall men's sweaters and outerwear is not always easy but here are some suggestions. 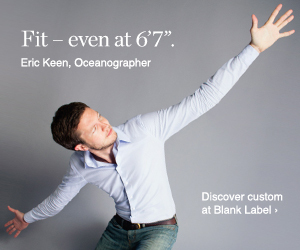 For all things outdoor and open-air, Eddie Bauer is a good start and their tall items have clear measurements so taller men can check them against their needs. Below are a selection of sweaters and coats from the current collection. The cotton/cashmere range looks a good bet for a soft, casual feel. Read carefully and you'll see that it really is "just a bit of cashmere" - only 5% cashmere but the reviews on the web site were positive on the feel. Tall sizes have a back length of 29 inches and 1.5 inches longer than usual on the sleeve. The roll neck sweater (pure cotton) is a quarter-inch longer. This will probably suit men a little taller than the 6'3" (190cm) that the web site claims. The coats add rather more on to the length with an extra 2.5 inches (6.5cm) which doesn't sound much but can make all the difference. If you order and need an exchange or refund, then you can use prepaid returns or return it to the store, but you will lose a few dollars on the amount refunded. For other sweater ideas, try Destination XL, which has a range of Polo Ralph Lauren cotton sweaters plus some cheaper brands. Jos A Bank (part of the Men's Wearhouse Group) has a small selection in cotton, merino wool and cashmere for larger tall men, with sizes from 2XLT (XXL Tall) to 4XLT. You can also try Cutter & Buck and see our last article on the topic of tall men's woollen sweaters. Outerwear, from smart work coats to sports gear, is one of the trickier areas for tall men. We're working on an article to cover this but in the meantime, Jos A Bank offer some casual jackets in larger tall sizes, while for hiking/sporty coats and fleeces, you can try REI, Columbia or Sierra Trading Post. Hey man, was just browsing through the internet looking for some information and came across your blog. I am impressed by the information that you have on this blog. It shows how well you understand this subject. Bookmarked this page, will come back for more. You, my friend, ROCK!! !